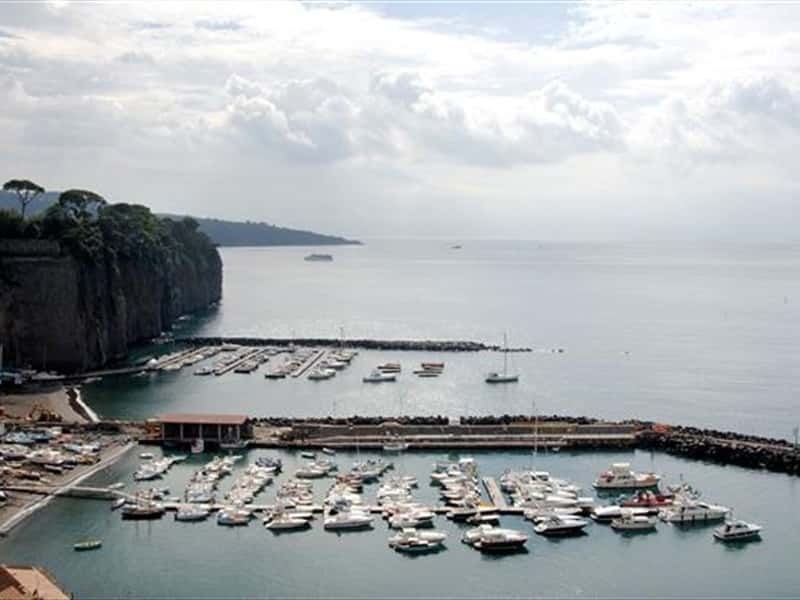 Subsequently occupied by the Greeks and Sanniti, under the rule of the Roman with the name of "Planities", it became an "otium", a resort for the noble patricians, that built here their Summer villas and residences, linked, since then, to the "municipium" of nearby Sorrento. The history of Piano is closely linked to Sorrento, and despite numerous attempts of separation, the administrative autonomy was only recognized in 1808 at the times of Giuseppe Bonaparte. - the Basilica of St. Michael, built in the IX century on the ruins of an ancient pagan temple. It currently features a magnificent Baroque façade, preceded by a stone staircase with bronze portals and a square Bell tower. Inside are preserved marble statues attributed to the sculptors from the school of Bernini, a most valuable coffered ceiling, seven paintings by Francesco Solimena and a rich marble balustrade. - the Basilica of the Holy Trinity, built in 1543, is flanked by a massive square Bell tower. The interior is divided into three naves and is enhanced by a fine wooden choir, engraved with gold stucco decorations, a Neapolitan Baroque masterpiece of the XVII century, two paintings by Leandro Bassano (1610), a polychrome marble pulpit with canopy from the Neapolitan Church entitled to San Francesco of Paola and a painting of the Holy Trinity by Francesco Mancinelli (1871). - the Church of Mercy, dating from the XVIII century, with adjoining convent of Augustinian nuns and a charming cloister. The interior is octagonal with round corners and preserves an altar in polychrome marble, topped by a floral painting of the XVIII century of one of the pupils of Solimena, Joseph Bonito. - the Church entitled to the Assumption, a Latin Cross plan with three naves, in Baroque style. Inside it preserves a fine coffered ceiling, painted by Andrea Melancholy and a high altar of Florentine workmanship with a niche that holds the statue of the Virgin of Galatea, with Byzantine features. - the Colonna Castle, built in 1872 by Count Eduardo Colonna Doria del Carretto di Paliano on the ruins of the ancient Abbey of San Pietro a Cermenna. - Villa Fondi De Sangro, built in 1840 by the Prince of Fondi, Don Giovanni Andrea de Sangro. Today a national monument and an excellent example of Neoclassical architecture, built in an exceptional park setting overlooking the sea and at present houses the Archaeological Museum "Georges Vallet", a collection of documents and artifacts, unearthed by recent excavations, which reconstruct the history of the Sorrento Peninsula from Pre-history to the Roman Period. - the noble residences built here between the XVIII and XIX century, as Palazzo Maresca (1844), Villa Massa, Villa De Stefano, Villa Laura (all of the late XVIII century), Palazzo Mastellone (1612), Villa Ciampa, Palazzo Villa Romano (1654), Villa Henriette (XVI-XVII century), Villa Maresca Sopramare (XVIII century). This town web page has been visited 155,133 times.